A night of hits from Stevie Wonder? That’s a safe bet. 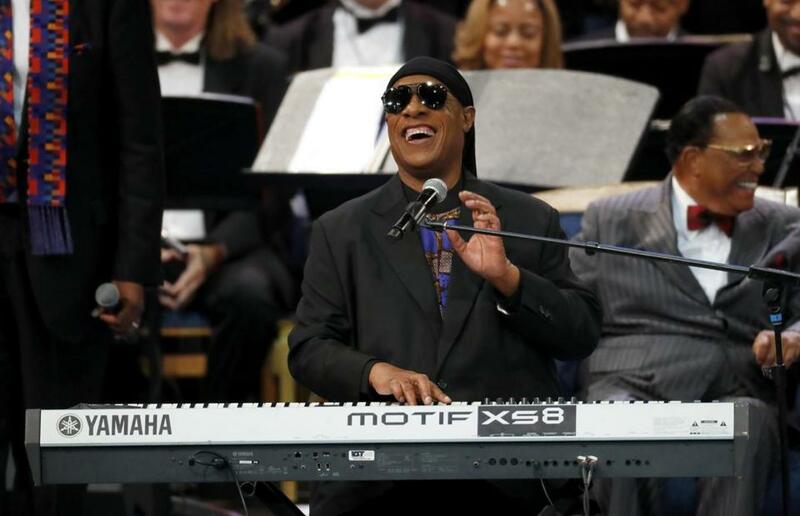 Stevie Wonder performed at the funeral service for Aretha Franklin in Detroit on Friday, then came to Springfield for a concert Saturday. SPRINGFIELD — Though billed as a grand-opening celebration for the gleaming new MGM Springfield casino, the stakes were not especially high for Stevie Wonder’s special appearance Saturday at the MassMutual Center across the street. The ever-joyful music man has only played a handful of gigs this year and has nothing to promote. But when Stevie Wonder finds his groove, there is no groove more emphatic. None deeper. It took a while to get there. At 68, Wonder took the stage slowly, led by one of his backup singers. He warmed himself up with a modest song from his catalog, “As If You Read My Mind,” from the 1980 album “Hotter Than July,” which came at the tail end of his phenomenally creative run through the previous decade. “Y’all with me?” he asked the audience a few songs later, swiveling behind a small fortress of keyboards to noodle with the funky clavinet sound that announces “Higher Ground,” one of those many signature songs of his. (“Superstition” and “I WIsh,” among others, came later.) Yes, Mr. Wonder, we’re with you. The back-to-back ballads “You and I” and “Ribbon in the Sky” were glorious testaments to the fact that his voice, more than 30 years since his last real hit, remains an eighth wonder of the world. Before he sang “Overjoyed,” he invited a couple of old friends to the stage, the Cecils, who have been married 61 years. Malcolm Cecil engineered several of Wonder’s immaculate early 1970s albums. When Springfield Mayor Domenic Sarno presented Wonder with a key to the city, the singer beamed. “I got the key to the city!” he nyah-nyah’d, like a kid on the playground with the only lollipop. Then he whipped back to his default emotion: “But you all got the key to my heart,” he said. No New Year’s Day to celebrate. In fact, it was just another ordinary day in the life of one of the true greats.